Billboard by Ilona Huss Walin during the Artproject Gästabud in Århus, Danmark 2003. Artspace Rum46 creates the project Gästabud - Fiest/Hospitality during 2003. Rum 46´s press release about Fiest/Hospitality. Review about the exhibition in the danish newspaper Information. I was invited by Rum46 to participate in an exhibiton called Fiest/Hospitality. The purpose with the exhibition is partly to discuss the Danish immigration politics and mainly to question the terms we and them. The practical frame for my participation was that I should make a picture for a billboard that should be placed at three different places in the centre of Århus - places where there normally is advertisement. The picture is made for the context billboard out in the cityroom, where people passing by the picture automatically asks themselves: Who is trying to sell what? I used three elements in this picture: rats, national coat of arms and statistics. 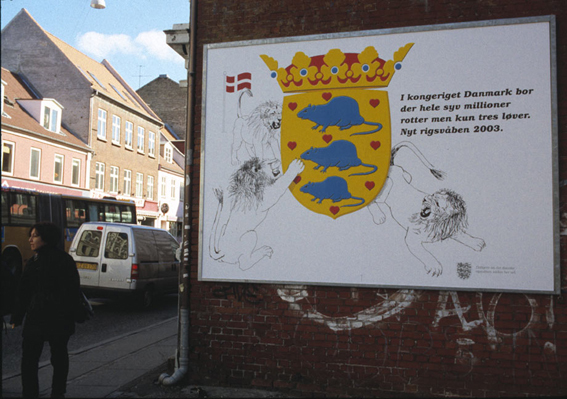 I placed three rats in the danish national coat of arms instead of the three lions that here are reduced to restlessly circle around the crown. Beside this I put the statistical text: The Kingdom of Denmark has a population of seven million rats, but only sixty lions. New national coat of arms, 2003. (The population numbers are approximately true). I thought it was interesting to blow life into an old symbol of power - the national coat of arms - and give it a new content. I also thought it was interesting to combine this old symbol of power with a modern one - statistics. This text, about population, reminds us how statistics are used in our daily life to tell the truth and to rule the world. There is an inner conflict in the picture between the old and the new symbol of power (heraldics and statistics). This inner conflict makes the picture loose an obvious statement. There is only questions left. I wanted to play with agitating symbols which at first sight gave the picture a naiv touch, but at the same time a crystal-clear touch. I think that the picture created curiousity and reactions out in the cityroom. Some of my billboards where torn down (advertisement is almost never torn down). I also think that this billboard was open enough to let people see themselves and reflect upon their own way of thinking.